Designed by and for Theis and Khan, Bateman’s Row maximises accommodation for both commercial and residential units at a tight site in Shoreditch. It provides several lettable units, making the scheme viable, and includes an architects' office and family home. The building has received the following awards: RIBA London Award 2010, RIBA London Building of the Year Award 2010 and Hackney Design Award 2010. 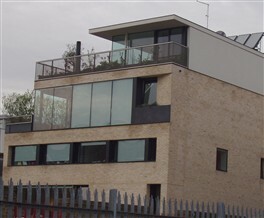 Bateman's Row was shortlisted for the RIBA Stirling Prize 2010. This page was added on 05/10/2010.